We are passionate about what we eat and whenever possible include organic food in our daily diet. The reason is simple: For every piece of organic food we eat, we are reducing the amount of pesticides and chemicals which enter our bodies. Surely that has to make sense! 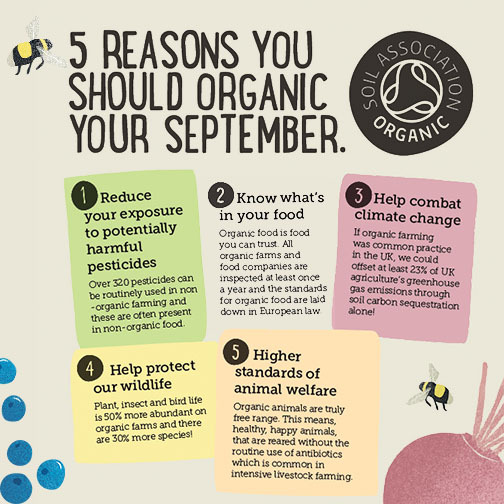 To mark the start of the Soil Association’s #OrganicSeptember we have created a series of short videos where David shows you how easy, affordable and fun it is to cook Organic. We hope that by sharing these videos, it will encourage more people to introduce Organic food into their diets, and also demonstrate that anyone can prepare delicious home-made food. We would love to hear your comments and feedback, and it would be fantastic if you could create your own videos and shared them with us! Below we will be adding a list of the videos as we film them, please click on the title to go to each video as well as the page where you can download the recipe.